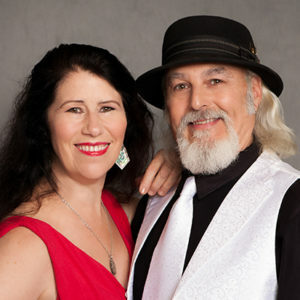 Wendy DeWitt with Kirk Harwood, play boogie woogie and blues that is garnering national and even International attention. This powerhouse duo are two-time regional winners and International Blues Challenge Finalists. After a European tour in January of this year, the band’s latest album, Getaway made the top of the charts in Italy. Wendy, a Santa Rosa High graduate, is a local girl made good story. She caught the attention of Western Swing Hall of Famer Tommy Thomsen (Sonoma) at age 10, and hasn’t stopped since. Former pianist for Hank Ballard and Steve Freund, Wendy has also played with Hank Ballard and the Midnighters, Charlie Musselwhite, Otis Rush and Jimmy Thackery. She tours national and international festivals and produces the annual Queens of Boogie Woogie and San Francisco International Boogie Woogie Festival, which draws artists from around the world. Jazz-trained drummer and vocalist, Kirk Harwood worked with Norton Buffalo (Steve Miller), Huey Lewis, Tommy Thomsen and Roy Rogers, before teaming up with Wendy in 2012. Kirk Harwood plays traps with a passion, precision and creativity that only comes from training, experience, and inherent soul. His early bands include Huey Lewis and Clover, Norton Buffalo and Roy Robgers and tours of major venues while opening for Steve Miller. Kirk is a veteran of West Coast blues, rock and soul and for 30 years accompanied Western Swing Hall of Famer Tommy Thomsen.